This book is the result of Lyne Marshall’s collaboration with poet Neal McKenzie and was published in 2003 by Fox Galleries, to compliment an exhibition of the same name. The artwork from the book was next exhibited at Logan Art Gallery in 2005 and Bundaberg Arts Centre in 2007. 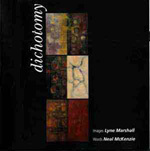 While it is a book for lovers of art and poetry, combined with Lyne’s books on the creative process, Dichotomy may be useful for artists, art students and teachers to show how determination and focus can bring positive growth. ‘It’s true that a picture is worth a thousand words, but it’s equally true that one word can convey a meaning that could take several pictures to explain. The literal meaning of dichotomy is “division into two parts”, and many of Lyne Marshall’s paintings in this exhibition reflect this. They exhibit a distinct dissection – earth and sky, night and day, subject matter and background, mood and scale, light and dark – two parts making a whole. But Lyne has brought another factor into her exhibition. She has collaborated with poet Neal McKenzie to amalgamate two different, but not disparate, art forms into a complete creation. Her paintings are joined with Neal’s words to produce a symbiotic balance.